I love going to cafes and little breakfast and lunch restaurants. I love sweet little spots with great coffee, wonderful little baked goods, and maybe a sandwich or a salad that tastes fresh and like it was made with love. I love the places that you don’t feel strange having a bite to eat alone, and that you can sit for an hour with a book and be very content just like that. Which is to say that when I was in London last fall I fell madly, deeply, overwhelmingly in love with Ottolenghi. Oh it’s just… just perfect. It’s clean and crisp, it’s mostly white with some bright read details. It has a large counter filled with the most perfect salads. Ones like Brocolini with Chilis and Almonds, or Braised Globe Artichokes, with Broad Beans, Pink Peppercorns and Preserved Lemons. And then just past the heavenly salads are the baked goods. The most beautiful Pistachio Cakes, dripping with rosewater icing, and Blackberry Friands, and dense and wonderful Chocolate cake you’ve ever had. It’s the sort of place you could go everyday for a month and not try the same thing twice. It’s the sort of place that’s hard not to fall in love with. And fortunately for those of us not living in London there are cookbooks and a weekly column in The |Guardian for us to steal his recipes and try to replicate it at home. Which is what I did the other day when I was in dire need of some sweets. 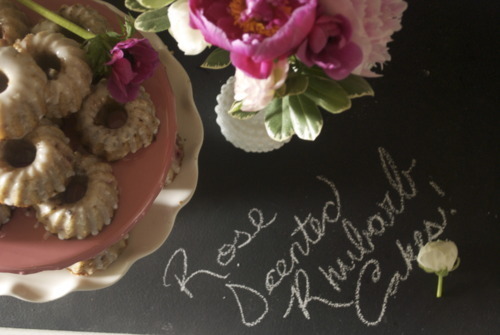 The recipe for these came from the Guardian and it called for blackberries but it’s to early for them here so I went with rhubarb, and then because I love rose so much I put some of that in the icing which really was wonderful. 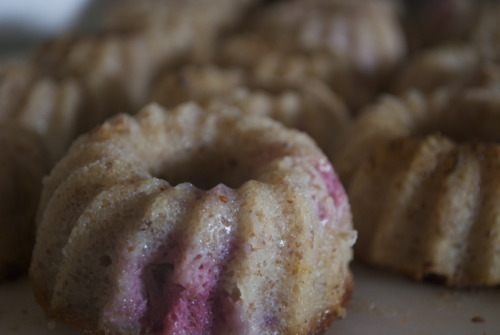 These cakes are very moist and very rich, thanks largely to the addition of ground almonds in them. Because of that they will stay very moist for several days, so it’s a great cake to make in advance of something, or just to keep in a jar for a week and eat one a day. 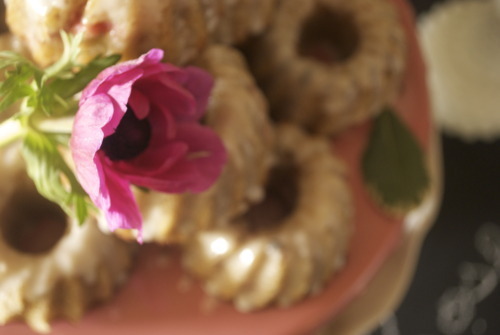 But they are so pretty, they would also be perfect for an afternoon tea. 4 big stalks of Rhubarb, washed and cut into 1centimeter (about 1/2 inch) pieces. On a parchment lined baking sheet spread cut rhubarb out in a single layer and then sprinkle sugar on top. Bake for about 20 minutes or until rhubarb is just beginning to get soft. Take out of the oven and let cool. Turn heat down to 350F. 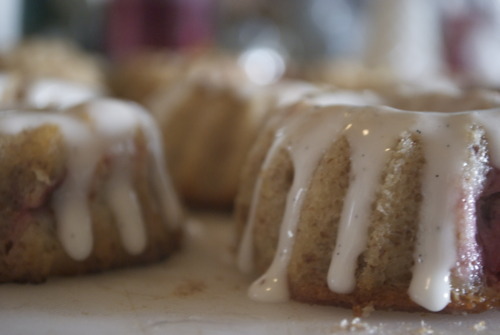 Butter mini bundt pans, mini loaf pans, or mini cupcake pans. 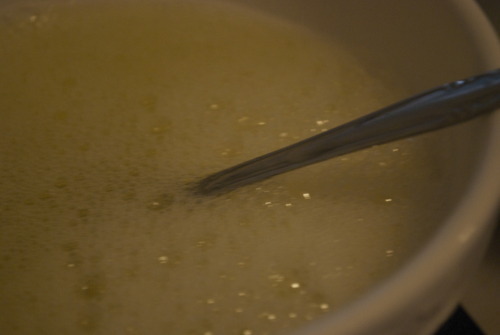 Whisk up the egg whites until they’re frothy, but not full whipped. 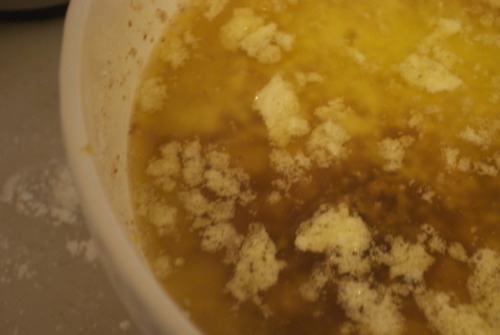 Add in the lemon zest, melted butter and vanilla. 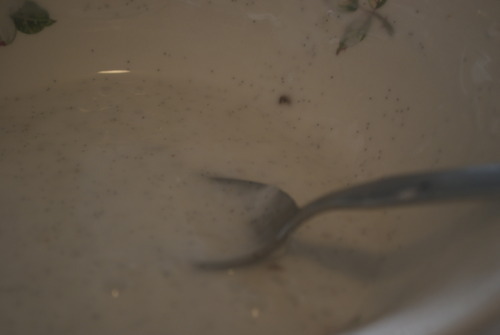 Sift in all the dry ingredients and fold gently together. 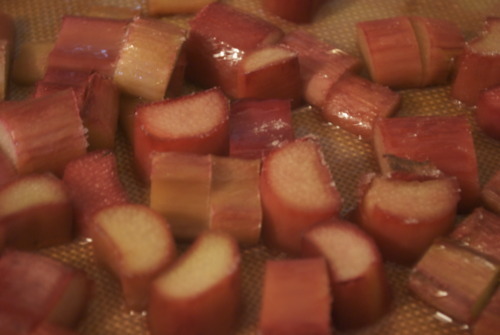 Then fold in the roasted rhubarb and spoon into the prepared trays and bake until an inserted skewer comes outs with only a few moist crumbs, about 15-25 minutes. Allow to cool completely. To make the icing mix all the ingredients together until smooth. 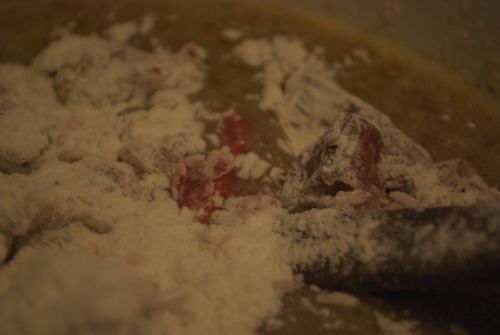 If it looks a little thick, add in some water or more lemon, if it looks thin add in some more icing sugar. 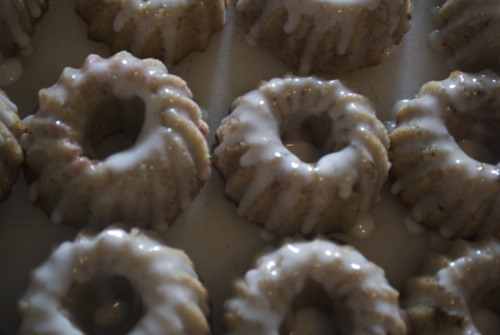 And then drizzle them on the very tops of each, the icing will run down and leave lovely little drips around each of them.